People have embraced the resting “b” face. “That’s just the way I look,” they reply grumpily if anyone ever points it out. To top it all off they get angry if anyone ever tells them to smile. While it may not be appropriate for someone to tell you to put on a happy face, they are really just trying to help you because smiling comes with a load of benefits for you and other people. Here are 3 fabulous reasons to turn that frown upside down. Putting on a happy face is something that will literally help decrease stress hormones in your body. So instead of slathering on some essential oils to decrease stress try pasting a smile on your face. Fake it ‘til you make it actually works in this scenario. The smolder is fun and all, but most people, when shown side by side pictures of people, choose the photo of the person smiling as the most attractive. You might have also noticed that when you smile people tend to treat you differently. That’s because something in their brain tells them that you are a good, trustworthy person simply because you look happy. If that doesn’t pique your interest then you might also like to know that smiling can make you look younger. Yes, it’s true. 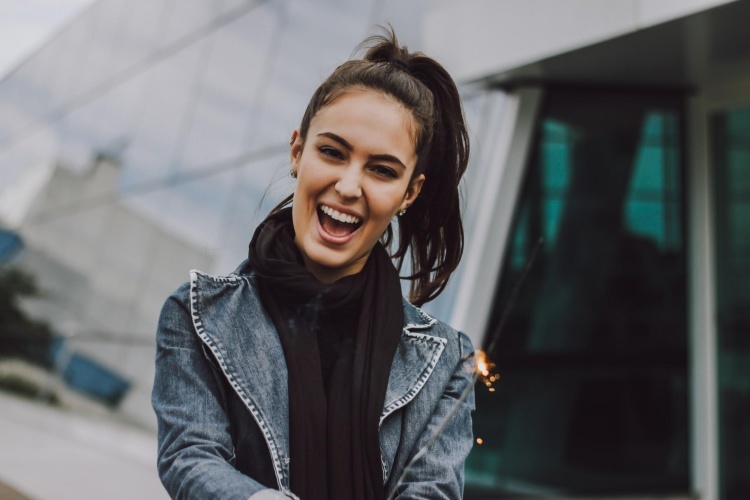 Some people think that smiling just makes them have more wrinkles, but the muscles used to smile actually lift your face, making you appear more youthful. This may seem like common knowledge, but smiling is contagious. Have you ever been watching a movie and the characters are smiling and before you know it you catch yourself with a grin on your face? When your brain sees someone else smiling it can’t help but want to mimic the action. The same happens to anyone who sees you smiling. You smile at them and their brain thinks, “Oh that looks like a good idea,” and tries to paste a grin on their face. So, one by one you’re helping to make the world a happier place by smiling at the people you interact with throughout the day. Just think, you smile at someone on the stairs, their brain tells them to smile. Without thinking about it they put on a happy expression and their mood begins to lift. Then they smile at the next person they see without even realizing that they are part of this beautiful ripple effect. It doesn’t take much to change your day or to change someone else’s. It just takes you acknowledging that the resting “b” face is a choice and you can choose to give more to the world than a moody expression.